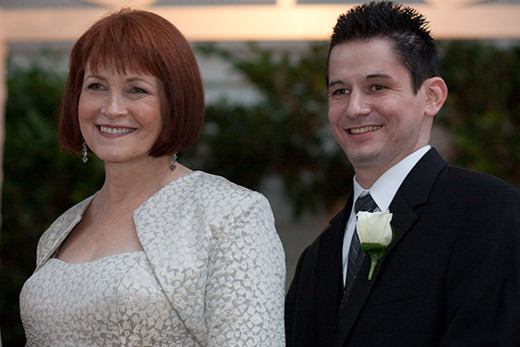 Andy Zebrowitz and his mother Cyndy Newcomer at a family wedding in 2009. Born in 1979, Andrew Morris “Andy” Zebrowitz grew up in the digital age and became a software engineer. He had a gift for understanding technology and could solve difficult problems that eluded others. When he died from a subarachnoid brain hemorrhage at age 30, his family searched for a way to honor his legacy. By establishing an endowed fund, the Andy Zebrowitz Memorial Brain Research Fellowship, Andy’s family will support biomedical engineering (BME) students in Emory’s Laney Graduate School as they work to develop new ways to diagnose and treat brain injury, trauma, and bleeding disorders. They announced their gift July 27, 2015, on what would have been Andy’s 36th birthday. The goal is to improve protections for the brain. Students chosen as Zebrowitz Fellows are likely to be working in interdisciplinary teams under the guidance and mentorship of BME graduate faculty whose research spans BME and neuroscience. The new endowment will support BME graduate students, who are the work force behind so many research discoveries at Emory, for generations to come. “At the end of the day, grad students and fellows do the work. I have some initial ideas, but what matters is the demonstration and pursuits of ideas, and you can’t just have a robot doing the work. You need grad students who are good, and donor funding helps attract them,” said Hanjoong Jo, John and Jan Portman Professor of Biomedical Engineering, who relies on graduate students to move forward his leading work in atherosclerosis. The current Zebrowitz Fellow is Kyle P. Blum 18PhD, who is studying how the brain can interpret electrical signals as information about body orientation, and how this information is altered in some neurological disorders such as peripheral neuropathies and Parkinson’s disease. Like the researchers his family is supporting, Andy was willing to think differently and push limits of what everyone knows. His family and friends knew him as an independent thinker, a rebel who loved to push boundaries. In the years that followed, his mother, uncle and other family members celebrated Andy by continuing his passion for trivia. They play at Rosa’s Pizza in East Cobb and named their team The Ranting Kittens. Andy’s mother, stepfather, and maternal grandmother also sought a way to memorialize him for future generations. To make that happen, the family relied on Andy’s sister. After his death, Harpak moved from Israel to Atlanta and applied for work at Emory as a way of expressing her appreciation for the efforts to save his life. Today she is associate director of development and alumni relations for the Laney Graduate School. To support the Andy Zebrowitz Memorial Brain Research Fellowship and other doctoral programs at the Laney School of Graduate Studies, contact Robin Z. Harpak at 404.712.9341 or robin.harpak@emory.edu.